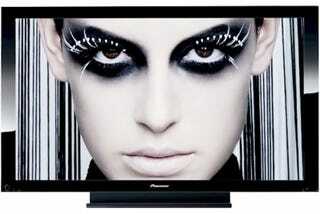 Click to view Pioneer's Kuro plasma sets are the best TVs on the market, right now, bar none. So it was a little disconcerting to hear that they're officially quitting plasma panel production and outsourcing it. We just talked with Russ Johnston, Pioneer's Executive VP of Marketing and Product Planning for Home Entertainment about the future of Pioneer's plasma business, in particular, Kuro. Good news, plasma theater diehards: Kuro is going nowhere, and they're keeping (most) of its magic to themselves. How? According to Russ, the Kuro recipe for its ultra-blackness is "three core elements—truthfully, all three are just as important—the filter, the processor" and the panel. And all they're outsourcing is the panel, or in Russ's words, "just the glass." Pioneer's former leg up on the panel itself—in-case cell structure—is being used by pretty much everybody in the biz now, so there's not really a "dramatic difference" from panel to panel. The panel supplier—probably Panasonic, since it's the only one they've announced they're holding discussions with—is in fact "going to learn or we're going to disclose a few things about our module so they can apply the correct specification to us." But it's the processor and software that actually directs how the panel fires, so most of its secret formula will remain that way. It might be easier to reverse engineer the software and filter side of the recipe if they know what's in Pioneer's panels though. Bottom line though, Pioneer plans on maintaining the same standards and their "goal to get that extreme contrast model and combine it with a new, unique form factor" is "unwavering." The last sets we'll see with in-house Pioneer panels are coming out this June, and they'll be announced in May. We'll see outsourced sets sometime in 2009, which is when we could also see the first Pioneer LCDs in the US, but they won't bear the Kuro name unless it "has the DNA of Kuro." Lastly, the lower production costs might not immediately translate into cheaper sets—after all the move is make plasma profitable again.